If you require a specific keyed alike padlocks matched to a code or a number sets of keyed alike padlocks please contact us. 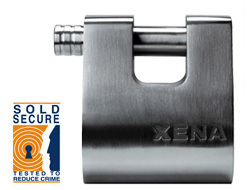 Xena's straight shackle padlock affords the protection of any closed shackle padlock with additional resistance to hack-saws and bolt cutters. The are also commonly used with steel chains to secure gates, on shipping containers and also to secure roller shutter doors. The body is constructed from solid stainless steel using a huge 14mm thick shackle for maximum resistance agaist cutting and bolt croppers. It is important to remember this padlock can be locked with the alarm de-activated and used as a traditional high security padlock. You may wish to de-activate the alarm when the item you are securing could be knocked accidently or in high wind conditions. Each padlocks comes with 3 keys. We have one size in this model but with 3 different shackle dimensions of 25mm clearance, 35mm clearance and a special thin shackled model with 19mm clearance. Please select your choice from the drop-down list above and then click "full size and dimensions". 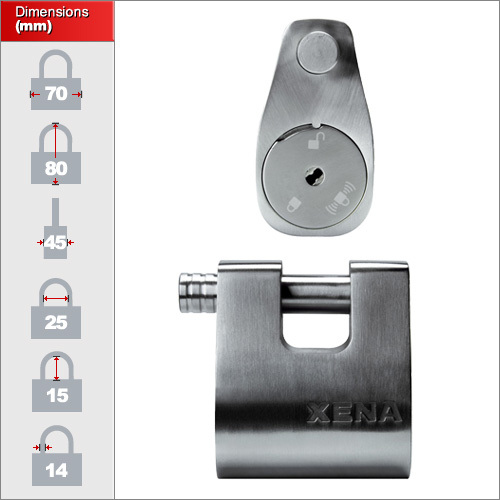 View the exact dimensions of the short shackle by clicking here. The lock is useful in any security situation especially for motorbikes and gates where someone might try and tamper with the security measures. It is also exceptional in preventing tresspass or vandalism where the movement caused by someone jumping over a gate will trigger the alarm. Each lock contains a shock and movement sensors connected to a microprocessor triggering a 110 dB alarm. The sensor is also intelligent enough not to be triggered by minor movements caused by wind. It is important to note that cheaper alternatives are not controlled by variable microprocessors and can be activated by the slightest touch or even during wind or rain.